Dedicated in the memory of Elton Phillips. Manufactured by Central States Apparatus and purchased through Wild Fire. 4-2 is the 3rd new engine purchased in the history of the department. 4-2 carries 1300 feet of 5 inch hose with capacity for another 1200 feet, a 2500 gal port-a-tank carried in a Zico Lift, 1000 Gallons of Water, 1500 gpm Hale single stage pump, Mounted deck gun with TFT Variable Stream nozzle with optional ground stand and stacked tips, has a 5kw inverter for power, four 500 watt scene lights, and 200 foot power reel. This piece has suction intakes on all four sides. Manpower on 4-2 consist of a Pump operator, officer w/ SCBA and 3 SCBA in Jump Seats. It carries 6 pre-connected hand lines - two 200' 2" attack lines, two 200' 1 3/4" attack lines and 2 200' 2 1/2 attack lines all equipped with TFT Variable Stream / Variable Flow nozzles. It also has 200' of 3 1/2 inch hose with a gated wye for incidents where the apparatus is force to be farther than 150 feet away. 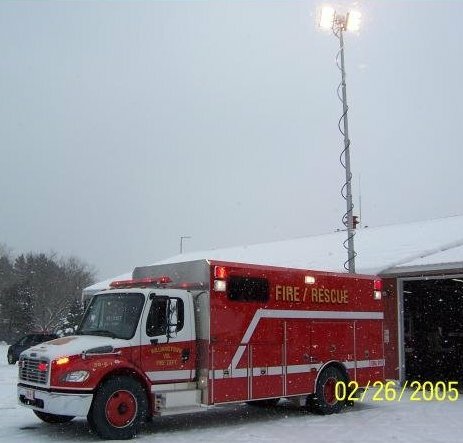 4-2 is equipped with the departments MSA Evolution 5000 TIC in a Truck mounted charger. The TIC was purchased with help from the FEMA Assistance to Fire Departments Grant. 4-2's primary duty in district is first engine due on all fires. 4-2 will run second due for all mutual aid calls to the scene when requested. 4-2 was designed to be a 20 year piece of equipment for the department, The first 10 years as the first due engine and the second 10 years as second due / mutual aid engine. Scheduled for replacement in 2016. 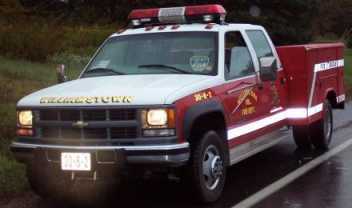 Purchased used from the Moyer Corners Fire Department (New York) in 2009. 4-1 carries 1300 feet of 5 inch hose, 1000 gallons of water and a 1500 GPM Hale two stage pump. Manpower on 4-1 consist of a pump operator, officer w/ SCBA, 2 SCBA in 911 Seats and a fifth and sixth person in the rear. It carries 4 pre connected hand lines - one 200' 1 3/4" attack line, two 200' 2" attack line and a 200" 2-1/2 attack line all equipped with TFT Variable Stream / Variable Flow nozzles. There is a pre-connected deck gun above the pump panel. It also has 200' of 3 1/2 inch hose with a gated wye for incident where the apparatus is force to be farther than 150 feet away. 4-1's primary duty in district is water supply via 5 inch hose or tanker fill site. 4-1 also rolls on all Motor vehicle accidents for extrication and fire suppression. 4-1 is first out for Mutual Aid calls. 2005 Freightliner M2 with 18' Walk-in Body. Purchased new in 2005 from 4 Guys. 30-6-1 was designed for the uses of today and 20 years from now. 6-1 is equipped with a 25kw PTO driven Generator that supplies a 30' light tower with 9000 Watts of lighting, two 500 watt halogen lights mounted on the side, two 200 foot electric power cords, 2 exterior outlets and several interior outlets. The interior 110v outlets run off of the shoreline or generator and automatically switches. The body is a 18' Walk-in design contain storage for additional EMS Supplies, a command desk, 6 box lights and 6 SCBA's and seating for 11. It is also equipped with heat and AC for rehab. The seats were designed to accommodate 3 patients on backboards. The truck has dedicated compartment space for Extrication tools, Hazmat supplies, Tool boards and spare SCBA Storage. The unit comes with a complete LED Lighting package and MX7000 Light bar. 6-1 runs on all accidents, all in district fires and mutual aid calls for manpower. Purchased as a Demo Unit in 2003. Purchased with fund received from the FIRE Act Grant in 2003. Placed in service after three air operated dumps were applied to the rear of the tank replacing the single manual dump allowing dumping ability off either side or the rear of the truck. The tanker is filled using 2 deuce and a halves with storz connections. 5-1 is designed to be a 1 person operation to help in low manpower situations. 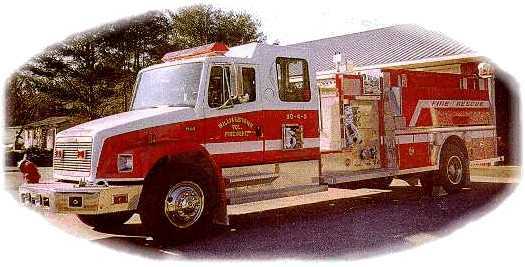 5-1 is a 1800 gallon Tanker caring a 2100 gal port-a-tank and has a 400GPM pump. 5-1 runs on any fire in district. It runs second out on all mutual aid fires. Our tankers are replaced on and as needed basic. 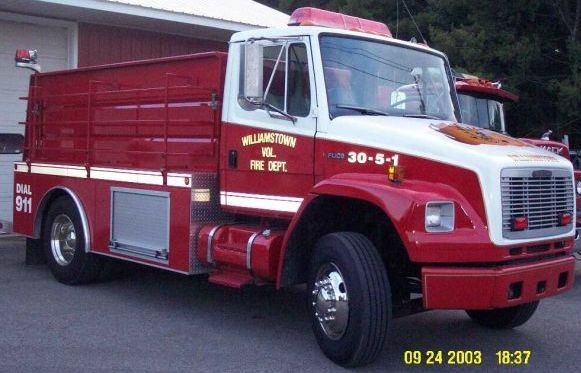 This truck is Dedicated to the Williamstown Ladies Auxiliary (now disbanded). Purchased new through state bid 30-6-2's main function is EMS response. This vehicle is greatly reducing the wear and tear on 6-1 by responding to EMS calls. 6-2 carries our Semi-automatic defibrillator, the first in our area operated by a fire department. (Ambulance service is 15 miles away.) If needed 6-2 may also be used as a utility vehicle. 6-2 will respond to Mutual Aid calls for EMS and overall 95% of all calls for the department.